Well, the unity didn’t last long. Immediately after Unite the Right, those who did not participate started attacking the speakers and organizers. For instance, Katie McHugh  and AntiDem  have used Unite the Right as a pretext to attack Richard Spencer. Now the speakers and organizers are blaming and disavowing one another. 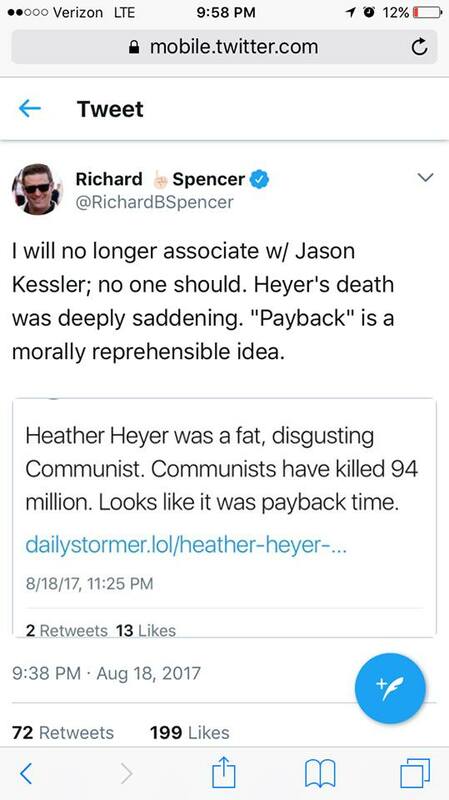 Richard Spencer, Eli Mosley, and Baked Alaska, for example, have disavowed Jason Kessler over a tweet about Heather Heyer, who joined the violent mob that attacked Unite the Right and died as a result. We can come up with a long list of problems with Unite the Right. The fact that the Unite the Right planning sessions on Discord had an antifa mole who recorded everything  does not speak well of the prudence and operational security of the organizers. Nor does the fact that the organizers did not have lawyers on hand in case of arrests, and they did not impress upon the participants the necessity of not talking to the police until provided with a lawyer. The biggest problem, however, is that the event was announced four months in advance, giving the enemy time to organize a response. But even with all the organizational problems, the fact remains that Unite the Right would have gone off without a hitch if the police in Charlottesville had done their jobs. We have to hold fast to this fact and insist that 100% of the blame for the deaths and injuries in Charlottesville must ultimately be laid on the city government and the governor of Virginia. It is not the fault of Jason Kessler, the principal organizer. It is not the fault of Eli Mosley, who conducted his organizational meetings in a most impressive manner without knowing that the enemy were listening in. It is not the fault of Richard Spencer. It is not the fault of James Fields, who was clearly acting in self-defense. It is not the fault of anyone at Unite the Right. Blaming the government does not, of course, absolve the rioters of their own responsibility. But they never would have been able to attack the rally with a whole array of lethal and non-lethal weapons if the police had done their jobs. And the fact that many of the people at the rally were carrying guns, but none of them killed any of the protesters, even after being assaulted with deadly weapons, shows a miraculously high level of restraint and discipline. Blaming the government does not, moreover, imply that Unite the Right did not make mistakes. Clearly, things could have been handled better, and they will be handled better in the future. As for Jason Kessler, if we can give Kessler the bulk of the credit for what went right about Unite the Right, we also have to assign him the bulk of our “room for improvement” list to study. But it is a list that everyone else should be learning from as well. Frankly, though, I am disgusted by the disavowals and tinfoil hat conspiracy theories being directed at Kessler. 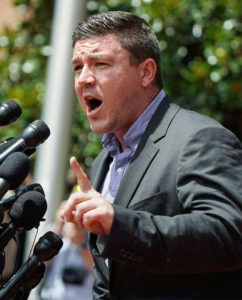 Yes, Jason Kessler once supported Barack Obama. But nobody is born a white advocate. We were all something else before we came to this movement. Julian Langness, for instance, was actually an Obama delegate at the 2008 Democratic convention. 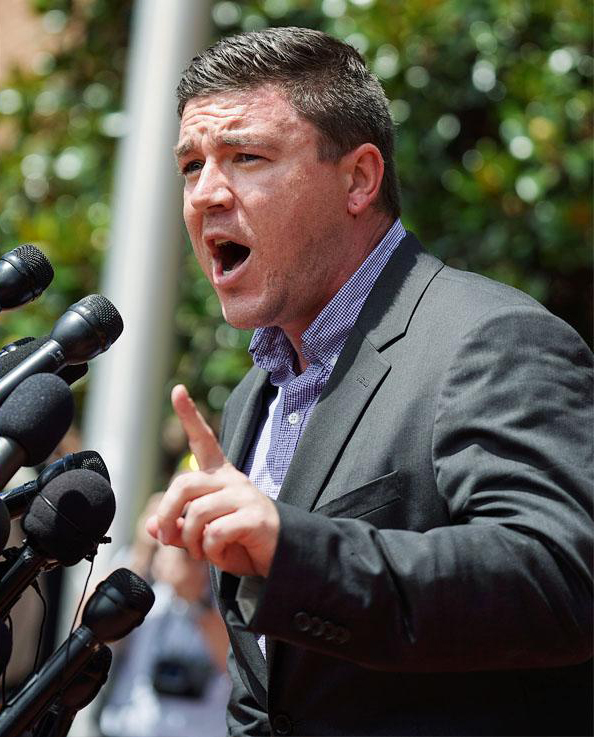 If being something else before he joined this movement disqualifies Jason Kessler, it disqualifies us all. Furthermore, as our movement grows, it is inevitable that more ex-liberals are going to join our ranks. These people should be welcomed, not greeted with paranoid finger-pointing from the lunatic fringe. Remember: every lunatic we coddle is keeping a hundred normal people from joining our ranks. No, Kessler was not part of the Occupy movement. No, Kessler does not work for George Soros. No, Kessler did not write for CNN. No, Kessler was not a paid Democratic consultant. 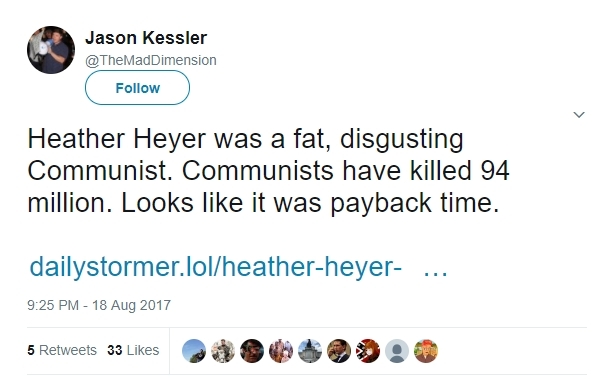 It is in bad taste to mock a dead woman just because she was “fat” and “disgusting.” As for the assertion that her death was “payback time,” perhaps Kessler believes in God or karma, or at least “poetic justice,” so that those who join a rioting Leftist mob take on responsibility and merit punishment for all Leftist crimes. Such a view might well be theologically or philosophically defensible. But in any case, it is highly likely that it is consistent with Heather Heyer’s own views, and the views of her fellow rioters. After all, if white people today are collectively responsible for slavery and colonialism, why are Leftists today not collectively responsible for the millions of victims of communism? But there is a more down-to-earth, less metaphysical sense in which Heather Heyer really is responsible for her own death. After all, she joined a rioting mob that had committed countless crimes, including assaulting the car of James Fields. To escape them, Fields stepped on the gas and crashed into the cars in front of him, killing Heather Heyer. I predict that James Fields will be found not guilty on grounds of self-defense, if his case even goes to trial, and Heather Heyer will be classed not as a victim but as a perpetrator. I am going to save my tears and sympathy for the innocent victims of that mob — who were beaten, slashed, burned, and blinded with acid — not the perpetrators. Of course Heyer might have simply been a political innocent who was manipulated and deceived into joining the mob. But by 1:45 in the afternoon, surely she had seen enough violence and enough weapons in the hands of her fellow protesters to get a sense of what she was lending herself to. Beyond that, people who join these events out of naïveté need to know that the reason the police stood down was not just to allow the antifa to attack, but also to goad Unite the Right into fighting back, so that they could then be blamed for any injuries and deaths among the Leftist mob. Heather Heyer and everyone else in that mob was regarded simply as cannon fodder, as the raw material from which the Left could manufacture martyrs after they engineered anarchy and mayhem. It turns out that Kessler — at the end of what is surely the worst week of his life — had sent out a tasteless drunk-tweet linking the far more tasteless attacks on Heyer at The Daily Stormer. The next morning he thought better of it and took it back. I forgive him. Richard Spencer, who knows quite a lot about drunk tweeting (and far worse ), probably should have forgiven him as well, rather than joining the mob to denounce Kessler. Since Kessler was simply relaying a link to The Daily Stormer and stating the substance of the article, does this imply that Spencer will no longer associate with Andrew Anglin and Weev? Does it imply that he thinks that nobody else should? Kessler’s gaffe is just one more reason why what as come to be known as the “Alc Right” should seriously consider adopting Harold Covington’s General Order #10: Nobody working for a white homeland may use drugs or alcohol for the duration of the struggle. Unite the Right is history. What should come next? First, we need to take a page from the Identitarian playbook. Unite the Right was a high-risk, low-reward gamble for a movement that has very few people and resources. We need to think in terms of low-risk, high-reward events that can be replicated in every city and town across the country. Instead of large, unity events open to all comers — including undisciplined clowns — we need smaller, more disciplined groups with more focused messaging. Instead informing the enemy media and antifa rabble in advance, need to spring these events on the world, document them ourselves, and disseminate them to the world with our spin. Instead of big national events in one place, which require huge expenditures for travel and lodging, we need smaller local events all over the country. Second, as one commentator wrote, if Unite the Right did the torchlight march on Friday night, then cleared out of Charlottesville and let the Left tear the city apart before the eyes of the world media, that would have been the best possible outcome. As Mike Enoch pointed out, if the media had accurately covered the behavior of the Left in Charlottesville, the whole country would be on our side. We need to give them many, many more chances to get the story right. If we can stage enough of these edifying spectacles, we will slowly bring the public around to our way of seeing things. Note: Counter-Currents is still under attack. PayPal has shut us down and our webhosting company is booting us Monday or Tuesday. We are in a desperate cash crunch and may have a couple days of downtime next week. Please make a donation today, while you have the chance.